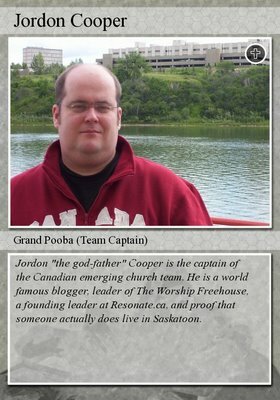 I was just Wifing at Aberdeen airport and found this Trading Card of Jordon Cooper at PernellGoodyear. Couldn’t resist posting it here. Coop is a legend and has been stirring up the internet since last century. Coop has been making up his own EC trading card set here. A much older Emerging Church Card series, btw, appeared on Liquid Thinking in 2003. They were kind enough to make a card for me and give me a generous MacLaren rating. And no . . I didn’t pay them! tony – maybe embedding something in their WRIST or FOREHEAD would work? fake trading cards are great! love it!